Canon 50mm f1.8 I only use this lens when light weight is of the utmost importants. For the price and weight this lens is a stellar performer but is lacking USM so there is no simultanius auto and manual focus but for what I use it for that's fine. I used to take this lens along with my Elan II when backpacking. Since switching over completely to digital I now bring my 5D and 24-105 F4.0 backpacking and deal with the extra weight for the added benefit of digital and versatility. But the 50 F1.8 still remains in my equipment page and gets occasional use. Canon 50mm f1.4 This lens is sharper than it's 50 F1.8 cousin above but has USM for simultanious auto and manual focus. I use this lens when shallow depth of field is needed or in low light situations. It is a great lens to use for night photography or indoors and has nice color and bloke. This lens along with the 5D without the vertical grip are fairly inconspicuous and yeilds stunning photographs. Canon 100mm f2.8 Macro If you like to photograph things close up this lens is a must have. Be warned it has a really shallow depth of field and the autofocus is obismal. When I'm not using a tripod I put it on manual focus and move the camera back and forth to get the results I want. Put this lens on a full framed camera and it can achieve 1:1 magnification. Combine this lens with the Kenko extension tubes and you can get even more magnification. This is one of the sharpest lenses Canon makes despite it not being an L series lens. I have found that the lens hood for this lens is pointless. Canon 135mm f2.0L This lens along with the 1D Mark II is one killer combination. You can add a 1.4x or 2x extender to get more reach. The autofocus of this lens is simply amazing locking on in very dark situations. This lens is small, very light weight and produces spectacular results. When light weight and blazing autofocus is needed I carry this and the 1.4x Extender. Even though this is an L series lens it does not have weather seals. Canon 500mm F4.0L IS A very specialized lens but way cheeper than getting trampled by a Moose. I choose the 500mm over the 600mm simply because of weight and size. I can handhold the 500mm as I often do from a car where the 600mm would be too large and heavey to hand hold. I mount the 500mm to my normal tripod with a Wimberley Sidekick. The 600mm would require a full Whimberley. This way the Sidekick helps reduce weight since I don't need two tripods and the full Wimberley weights a lot more, and cost since a second tripod and a full Wimberley is expensive. The bloke on this lens is amazing, the autofocus is fast and it is tac sharp. I typically use this with the 1.4x extender. Canon 24-105mm f4.0 ISL In early 2007 I picked up this lens to replace my 28-135mm. This is a good general purpose lens, with a constant F-stop of F4.0, Image Stabilization, weather sealing, has a 77mm filter size and it is fairly light. It outperforms the 28-135 in almost every respect, doesn't have quite as much range and is only a bit heavier but well worth it. Canon recessed the Image Stabalization switch so it is very difficult to accidentally change. Canon 24-70mm f2.8L This is a fabulous lens and lives on my camera 90% of the time. I know it is heavey and built like a tank, but it delivers superb image quality. The unique design make it resilliant to the weather when the lens hood is attached. This is my prefered lens to use in rainy conditions since the front element is protected the best of any lens of this range, even the 24-205mm. Canon 100-400mm f4.5-F.6L IS I have a love-hate relationship with this lens. I love the range but I hate the lens hood and the push pull design. The image quality is great at the center making it a good for any camera that is not full framed, especially the D30, D60, 10D, 20D and 30D cameras. But it vignettes quite a bit on a full framed lens. Since there is no weather sealing I find that dust can make it's way into the lens and gets moved around with the push pull design. Once you get used to the push pull it is pretty fast but I would prefer to not have it. This is the very first Canon lens sporting Image Stabilization so it needs to be turned off when on a tripod and it seems to have problems if you point the lens too vertical. The mount for the lens hood leaves something to be desired. With all those negatives I still love the range of this lens. I wish Canon would come out with a 200-400mm to replace this lens and fix all the problems I listed above. If I need to travel light but I need to wide range I take the 24-105mm and the 100-400mm. Canon 1.4x Extender Using the 1.4x extender is the most affordable way to get more reach, however it is only compatible with select lenses. Although I have found when doing extreme macro work I can put extension tubes and then the extender for more working distance. I have found that the 1.4x extender hardly affects the image quality so I have no worries when I put it on a lens. The only thing it will affect is it takes one stop of light. So it makes my 500mm lens go form a f4.0 to ann f5.6. If I'm shooting at dusk and the ISO is bumped up to 800 already then it may pose a problem but I'd rather get the shot than miss it. One thing to note is the end caps for the extenders are a little larger than normal lens end caps. I have replaced nearly all my lens caps so I don't worry about swapping them. Kenko Extension Tube Set You can add extension tubes to any lens focus closer than its normal set minimum focusing distance. Getting closer has the effect of magnifying your subject. They are exceptionally useful for macro photography, enabling you to convert almost any lens into a macro lens at a fraction of the cost while maintaining its original optical quality. The DG extension tubes have no optics. They are mounted in between the camera body and lens to create more distance between the lens and film plane. By moving the lens father away from the film or CCD sensor in the camera, the lens is forced to focus much closer than normal. The greater the length of the extension tube, the closer the lens can focus. These are a must for any macro photography work. Nikon Snap-on Lens Cap Nikon makes the best lens caps. They have tabs for release from the side and the front. 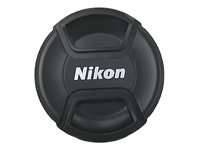 I am now replacing all my lens caps with Nikon lens caps because they are so much easier to use than Canon lens caps. Canon lens caps only have tabs on the side and because they are small they are more difficult to use. This becomes more evident in cold weather when you have gloves on, or on a lens with a long lens hood.